The Report Viewer is where you can browse your report. To open a report in the viewer, navigate to the Report Tab, and click the name of the report you want to open. The viewer shows all the columns in your report, as well as any charts. Note that you cannot save any changes made to the report in the viewer -- changes made here will only be reflected in your current session, and will be lost when you reopen the report. To save changes to your report, you must open the report in the Report Editor. Apply filters: Click the Add Filter button in the top left corner to add a new filter. 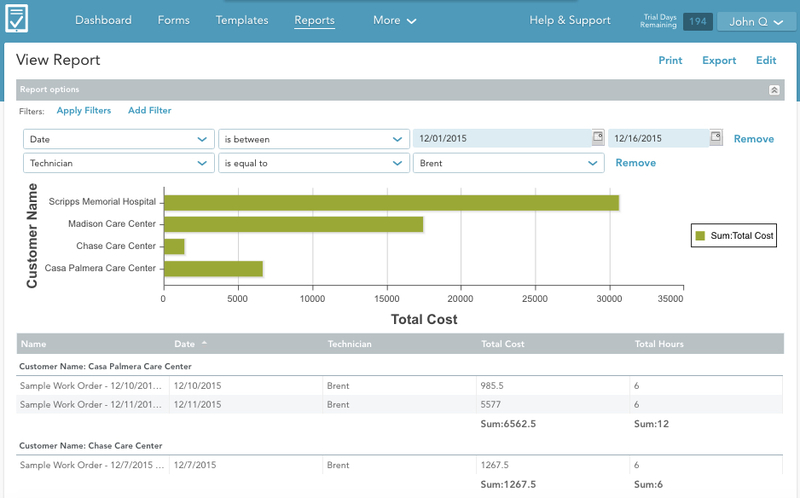 Then configure your filter and hit Apply Filters to see your changes reflected in the report. If the report has some filters already, you can edit and/or remove those filters as well. This is the most powerful functionality in the Report Viewer. See here for more on working with filters. Resize columns: Hover between two column names until the cursor appears, then click and drag left or right to change column width. This is handy when you can’t see the data in a column because it’s too narrow. Rearrange columns: Click and hold on a column name, the drag it to the left or right, and drop it in the desired position. Sort on a column: Click a column name to sort the report on that column. Clicking again will toggle between ascending and descending sort order. Print or export your report: Use the Print and Export buttons in the top right to share the report with colleagues or save it for your records. See the report export and report print articles for more. Open the report in the editor: Click the Edit button in the upper right to open the report in the Report Editor.